I have done major changes to how NPCs work. 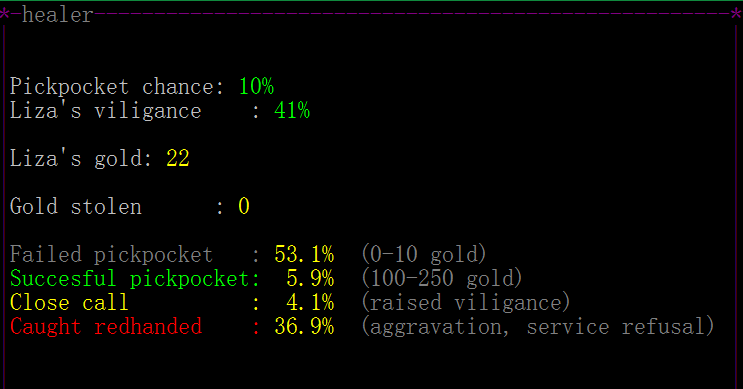 In v2.3 I changed merchants: Essentially they got an amount of gold, an inventory that updates as they trade and a mood. 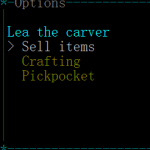 I also added the possibility to pickpocket them. In v2.5, this will apply to all NPCs instead of just merchants. 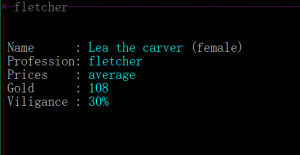 In addition, every NPC get a (randomly generated) name and a gender to make them a bit more personal. Every NPC is unique. 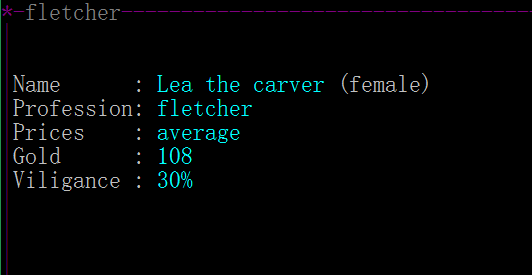 Every NPC now has a profession. Actually, they did before also (warrior, merchant, healer etc) so that is not exactly new. What is new is that their profession determines their inventory, their starting money, what items they are interested in, which services they provide and a few other things. 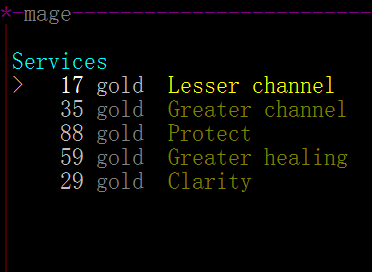 The set of professions are more or less the same as in v2.4 but what the NPCs can do has changed greatly. There are now a large number of possible services available depending on the NPCs profession. Exactly which services are available and at which price is depends on the NPC. When you interact with an NPC you will be presented with a menu of available services. Services can be for instance: buy items, sell items, sevice spells, training, pickpocketing and more. Most services costs money. 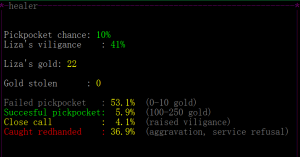 The NPCs gold will update as you trade and pay for services, just like it currently does for merchants. Some NPCs will offer to cast spells or otherwise give you some benefit for a price. Such services can be used only once per day and NPC. Such a service will give you a set of instant or temporary effects. An example of this is the healing service from a healer. The price of training does no longer increase as you get better. You can only train a certain skill once per NPC, when they taught you that you’ll have to find another NPC training the same skill if you want to learn further. 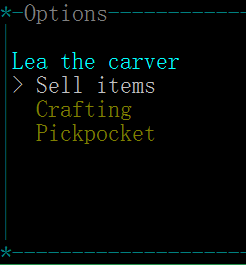 You can attempt to pickpocket any NPC. This is still based on your steal/disarm attribute, but it is a bit more advanced now. In fact it is now a minigame. The minigame involves your steal/disarm attribute as well as the NPCs new “vigilance” attribute. In short: you both make a check, and the four possible outcomes (you can fail or succeed, the NPC can fail or succeed) determines the result of the attempt. You can keep trying until you get busted. If you get busted you will become aggravating and the NPC will refuse to help you for the rest of the game. I think it would be a great opportunity to reevaluate some prices too. Even though I’m generally very diversely spending my money from game to game, I find that certain services I just never buy (and I played hundreds of games :P). Some of the alchemist’s prices come to mind among others. Yeah, it is quite hard to get prices right. I have been thinking about automatically deducing them from what effects they grant. But that may also not be appropriate at times. It would be helpful if you can provide a few concrete examples where you find the prices are off? *bone: 400 gold; 25% poison resist from bone meal is cool, but getting rid of poison completely is often even better as having an option to completely remove big poison is much better than reducing it by 25% and on small poisons this 25% barely makes a difference, so you can just take it anyway. Honestly my problem with those kinds of upgrades is probably less about the price and more about that they’re more sidegrades than upgrades – I can have more powerful one-time effect for free or less powerful but permanent effect for a cost – so unless the cost is small I’d rather use the gold in a more definite manner. 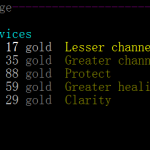 Other category of services would be Enchantress-type upgrades, where the price to enchant depends on quality of an item. I think it’s a little to steep: many heavier weapons are essentially impossible to enchant as the cost 3k+ – you hardly ever find that much and even when you do there’s always better use than a single enchantment. I like that it gives small weapons an advantage, but the scaling just feels too heavy. I see your point about the alchemical items. I may have overvalued permanence when setting prices for these. About enchanting: I agree there too. I will look over the price scaling there. Thank you very much for specifying!